Connecting large organizations to Canada’s tech community. We help partners adopt — and adapt to — disruptive technologies that drive competitive advantage and create social impact. Our partners include private and crown corporations, as well as government agencies. Large organizations are the backbone of the economy, but to remain competitive, they need to keep pace with today’s fast-changing markets. They need new solutions for new problems. MaRS Corporate Partnerships introduces large organizations to a curated roster of companies. We help them adopt startups’ products and services so that they can continue to grow and succeed. As a neutral third party, we also support partners looking to make positive change across the innovation ecosystem. Meet entrepreneurs, researchers and corporate peers; attend exclusive events with thought leaders and top executives. Benefit from curated introductions to startups in the health, cleantech, fintech and enterprise sectors. Participate in tailored programs to improve business strategies; take part in scenario planning, opportunity mapping and more. Sponsor mission-driven events and projects; elevate your position in the innovation ecosystem through the MaRS brand. Make positive social impact in the face of shifting regulations and issues like data privacy, the sharing economy and autonomous vehicles. Tailored product presentations from our most promising and successful startups. A three-phase exercise designed to help partners conceive, plan and execute on great ideas. Stress-test existing strategies and inform future planning in key MaRS-supported sectors. MaRS helps health startups access new customers and healthcare systems by connecting them with investors, policy-makers, customers and clinicians. Working with corporations, government agencies and non-profits, MaRS develops competitions that challenge Canadian innovators to solve pressing societal problems like climate change and the opioid crisis. Ron leads all corporate partnership activity at MaRS. He works with a diverse collection of global corporate partners, creating pathways to market for MaRS-supported companies, while also working with partners to unlock their own adoption capabilities. Ron’s entire career has been focused on bringing new technologies to markets, including nearly ten years as a venture capitalist, co-founding an AI-focused company, and gathering experience in major consulting firms. Prior to joining MaRS, Ron was the president and CEO of ENBALA Power Networks, a leading smart grid technology company offering optimization services to utilities and system operators. Ron holds a degree in industrial engineering from the University of Toronto. 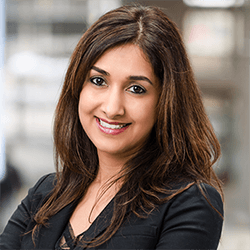 Shahira Bhimani is the Director of MaRS EXCITE, an innovative program that focuses on pre-market evidence-based assessment of new, breakthrough health technologies. The focus of MaRS EXCITE is expedited health system adoption of impactful technologies,through early collaboration between industry, academia, regulators, payers, government and the broader health system. In addition to leading the MaRS EXCITE program, Shahira plays an instrumental role in operationalizing the MaRS EXCITE model globally through her position as Vice President Business Development and Operations for EXCITE International. Shahira also serves in the advisory capacity to medical device innovators within the MaRS portfolio and provides strategic support to these ventures in their commercialization endeavors. Previous to this, as Vice President, Innovation Services at the Health Technology Exchange (HTX), Shahira focused on providing funding opportunities, support services and thought leadership to the Ontario medical device sector and health system at large. With a keen interest in innovation procurement as well as medical device reimbursement in local and international markets, Shahira has developed niche expertise and an extensive network of local and international partners in these realms. Over the years, her broad based knowledge around product development, commercialization and reimbursement of medical devices, has allowed Shahira to provide strategic guidance to innovative medical device companies in developing multi-market access strategies for evidence generation, commercialization and innovation adoption. 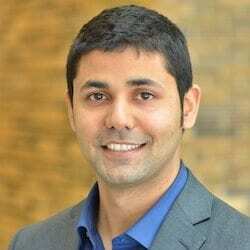 As a seasoned entrepreneur and clinician, Shahira brings a unique patient and clinical perspective as well as sound business acumen in medical device development and commercialization. Shahira holds a B.Sc in Physical Therapy from the University of Western Ontario and a Masters in International Health Technology Assessment and Management from the University of Montreal. Sonia is passionate about supporting the startup community in Toronto and enabling Canadian entrepreneurs to build and grow their disruptive, IT-focused ventures. Sonia has a strong background in client relations, project coordination, communications, and research and professional writing. Her work experience in a boutique consulting firm has exposed her to diverse industry sectors, including financial services, telecommunications, retail and professional Services. A long-time art enthusiast, Sonia is a dedicated volunteer with the Art Gallery of Ontario, where she is a Chair on the Volunteer Executive Board. Sonia is completing a post-graduate Certificate in Business Innovation Management at the University of Toronto, and holds an MA in English and Professional Writing, and BA from York University. 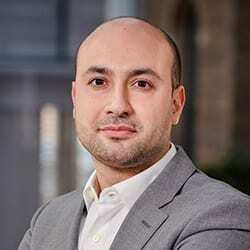 Dinaro is MaRS Partnerships’ director of fintech innovation solutions. He brings expert experience in digital payments, marketing, partnerships and business development across multiple verticals. Dinaro and his team build long-lasting relationships with traditional financial institutions, helping them adopt innovations and platforms built by the top fintech companies in Canada and around the world. 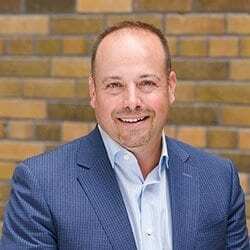 Prior to joining MaRS, Dinaro was director of business development and partnerships in digital payments at MasterCard Canada, where he was responsible for driving the company’s acceptance strategy and strategic alliances with large-scale retailers, FI’s and service providers. Prior to MasterCard, Dinaro led business development and partnerships at RedFlagDeals.com, a loyalty and content venture (acquired by The Yellow Pages Group). 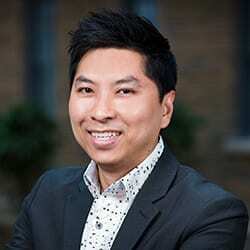 At Dell Canada, he led the marketing strategy and KPIs for Dell consumer and small business products. Shahab works with governments, agencies, foundations and private sector organizations to engage the global community in the identification and testing of novel concepts, methodologies and products that can address organizational innovation gaps and needs. He holds a B.Sc. in biochemistry from McMaster University and a Ph.D. in molecular genetics from the University of Toronto. Sasha is director of smart cities with MaRS Partnerships. This includes working closely with industry and government professionals, major user groups, civil society and academics to address key transportation sector challenges around congestion, GHG emissions, access and equity. Sasha helps catalyze the adoption of innovative mobility solutions in the sector. These efforts are currently focused on stakeholder engagement, iterative prototyping, business model development and market capacity development to support innovative transportation solutions in Ontario and Canada. Sasha is also engaged with the Advanced Energy Centre, where he advises and leads some of their Building Energy Efficiency and Energy Data Access programs. Sasha is an active member on the Board of Directors of the Green Button Alliance that oversees the evolution of the standard. Sasha also led the adoption of the Green Button utility data standard in Ontario, where he steered engagements with energy stakeholders, facilitated technical standard review, and managed pilot deployments and business case development. His work resulted in government expansion of Green Button adoption in Ontario to include natural gas and water data. Prior to joining MaRS, Sasha led the design and delivery of Ontario’s smart-grid-enabled conservation and demand response programs at the Ontario Power Authority (now IESO). He completed his masters in environmental change and management with a distinction from the University of Oxford. 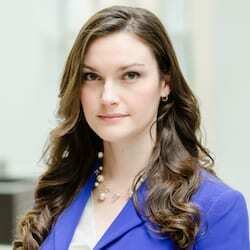 Kathleen Gnocato is Senior Manager, Corporate Transformation & Offerings Design Lead at MaRS Discovery District. In this role, Kathleen convenes and supports start-ups, clients, and partners as they work together to navigate industries in the midst disruption and change. In this client-facing work, Kathleen is passionate about addressing the world's complex problems with innovation and positioning Canada as a leader in the innovation economy. Leveraging her experience with complex problem-solving and human-centered design practices, Kathleen is responsible for the design and development of MaRS products and services to a range of clients. Clients include corporates, non-profits, regulators, government entities, electric utilities, large-scale generators, healthcare providers, and financial institutions. Kathleen also manages project delivery teams and internal resourcing to support the successful delivery of projects in Canada, the U.S. and South America. 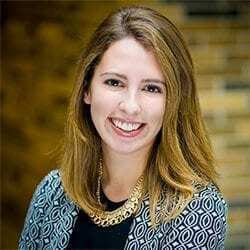 Kathleen’s professional background includes an advisory role at Canada’s Permanent Mission to the United Nations in New York and collaborative projects for the UN Office for the Coordination of Humanitarian Affairs, the Foundation for the Defense of Democracies and the MaRS Centre for Impact Investing. With a passion for innovation and entrepreneurship, Kathleen is also the program manager of the Global Ideas Institute based out of the Munk School of Global Affairs. Kathleen holds a Master’s of Global Affairs from the University of Toronto’s Munk School of Global Affairs and a BAH from Queen’s University. Contact our business development team to learn more about how we can help your organization.